ROME - Madame Ngo Dinh Nhu, the outspoken beauty who served as South Vietnam's unofficial first lady early on in the Vietnam War and earned the nickname "Dragon Lady" for her harsh criticism of protesting Buddhist monks and communist sympathizers, has died at age 86, a Rome funeral home said Wednesday. She died on Easter Sunday in a Rome hospital. The Gualandri funeral home said she was registered as Tran Le Xuan, her original Vietnamese name, meaning "Beautiful Spring." Madame Nhu lived in the former presidential palace in South Vietnam's capital, Saigon, with her husband, the powerful head of the secret police, and his bachelor brother, President Ngo Dinh Diem, who served from 1955 to 1963. She took on the role of first lady as U.S.-backed South Vietnam fought northern communist forces before Washington broadened its military effort. 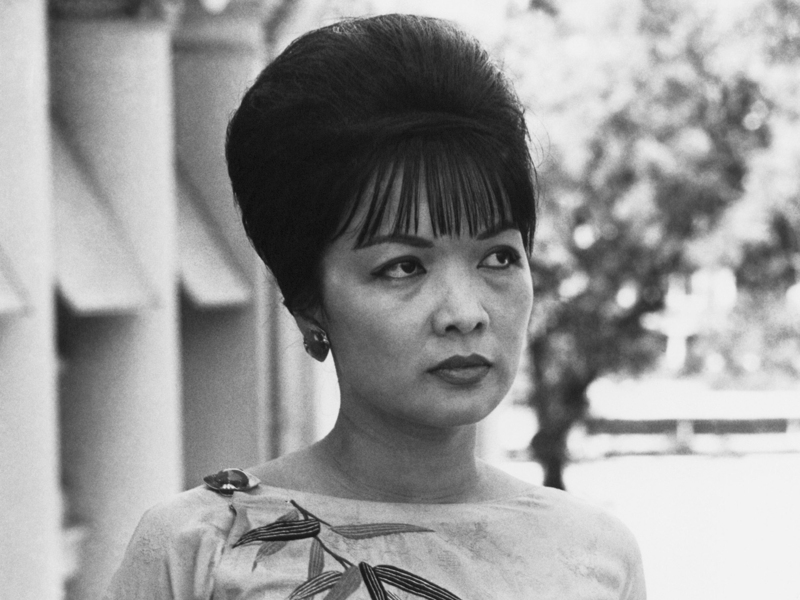 In the early 1960s, the trendsetting Madame Nhu was often photographed with her bouffant hairdo and glamorous clothes, including a tight version of the traditional silk tunic known as the ao dai, which showcased her slender body. She was equally well known for her fiery rhetoric, and was particularly outspoken against Buddhist monks who were setting themselves on fire to protest Diem's crackdown  once saying she would "clap hands at seeing another monk barbecue show, for one cannot be responsible for the madness of others." Her Buddhist father, Tran Van Chuong, who was serving as the South Vietnamese ambassador to the U.S., resigned in protest as did her mother, Nam-Tran Chuong, who was South Vietnam's permanent observer to the United Nations. Madame Nhu later called her father "a coward." She was in the United States on a speaking tour on Nov. 1, 1963, when her husband, Ngo Dinh Nhu, was killed along with Diem in a U.S.-backed coup, ending his eight-year rule. Madame Nhu went into exile in Italy and remained in Europe until her death, living a reclusive life in which she left her home only to attend Mass, according to family friend Thu Phu Truong of Seattle. "When you hear the news one of your friends or relatives passes away, you are probably very sad. In this case, I am kind of joyful," Truong told The Associated Press. "When her husband was killed, she was away, and she lived by herself ... for what? She is waiting for the day she can be reunited with her husband." Saigon, now called Ho Chi Minh City, fell to the communists on April 30, 1975 when tanks rolled into the city, reunifying the country. Madame Nhu had been raised Buddhist in Hanoi by well-off and highly influential aristocratic parents, but she converted to Catholicism in 1943 when she married Nhu, who was nearly twice her age. She remained deeply religious until her death, Truong said. In 1986, her brother was charged with strangling their elderly father and mother in their Washington, D.C. house. He was found incompetent to stand trial and deported to France. She issued a rare statement to The Associated Press at the time of the deaths, saying: "After what has been done against Vietnam, my country, my people and my family by the U.S.A., without it having ever contemplated reparation and without the West intervening on behalf of justice and truth as taught to it through the Messianic message, I do not recognize (their) right to question and judge any of mine." Her villa in the countryside on the outskirts of Rome included a chapel with a statue of the Virgin Mary. In Orange County, California, home to the largest population of Vietnamese outside the country, Auxiliary Bishop Dominic M. Luong said he met Madame Nhu in Paris a few years ago and was struck by her devotion to the church, which likely intensified after realizing her life in South Vietnam was over. "She finally realized it was a lost cause, she probably chose the religious way of life to get at peace with her mind and her political desire," Luong said. "She was a very, very interesting woman, very intelligent." Luong asked Orange County's flourishing community of Vietnamese Catholics to pray for Nhu during Mass on Tuesday morning and the diocese issued a statement about her death. Orange County's "Little Saigon" is home to thousands of Vietnamese refugees who fled to the U.S. after U.S.-backed Saigon fell to northern Communist forces. "It's another turning of a page of history," said Tony Lam, a former city councilman in the Orange County town of Westminster. "Madame Nhu herself has done a lot of work for the Republic of South Vietnam." Madame Nhu had four children. Her oldest daughter was killed in a 1967 car crash.